The Northern Sky Research (NSR) Satellite Manufacturing and Launch Services, 8th Edition report finds that despite a slow 2017 across the board, the global satellite manufacturing and launch market is poised to generate more than $250 billion in the next decade. 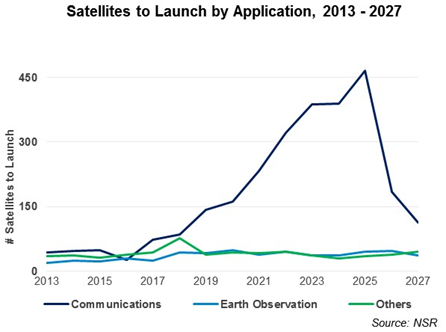 As commercial and government players begin deploying constellations, turning to smallsats to provide more flexibility across a system, and leveraging more advanced flexible and exquisite payloads, the requirements placed on manufacturers and launch service providers enabling these next generation systems will change. Situational awareness and technology development have received a renewed focus and will play an increasingly vital role in the market moving forward, built on escalating government activity and commercial players emerging for the first time. North America led the market in 2017 and is expected to continue as the global hub of activity, due to ongoing government demand for high-value satellites as well as a robust commercial market. Activity across Asia is closing this gap, however, with China, India and Japan placing a greater emphasis on competition and capabilities in the space domain. Alongside heightened geopolitical tensions and the perception of new threats to space assets, defense and intelligence spending on space is set to increase around the globe.